He called the UK's involvement in May's European elections "pointless" and hoped a deal would be done before then. 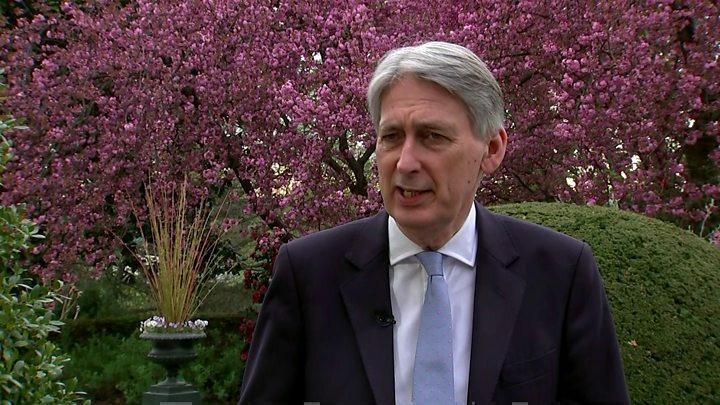 The chancellor said talking to the Labour Party about finding a way forward to resolve the Parliamentary impasse was not his "preferred route". But it offered a new way forward to achieve a Brexit deal, after which he could concentrate on issues such spending and "where our economy is going over the next few years". "I would like us to spend more of our bandwidth focused on growing our economy," he told the BBC's economics correspondent Dharshini David. "Until a deal is done we cannot make decisions about the spending review." "Clearly nobody wants to fight the European elections. It feels like a pointless exercise, and the only way we can avoid that is by getting a deal agreed and done quickly. "If we can do that by 22 May, we can avoid fighting the European parliamentary elections. "In any case, we want to ensure any British MEPs that are elected never have to take their seats in the European Parliament by ensuring this is all done well before the new European Parliament convenes," he said. "Britain is known as a bastion of democracy, and how we manage a challenging and complex issue like this is of huge interest," he said. "In a year's time, when this is behind us and people are focussed on other things, all this will be forgotten."